The kids and I have been having a ball lately with the fun DIY candy kits that were kindly gifted to us by the wonderful folks at the Marimo Marshmallow Store. What is The Marimo Marshmallow Store? It is the best place to find amazing Japanese products at the lowest prices. Their mission is to share with the world all of the amazing candy, DIY kits, snacks, stationary, accessories and much more by offering them at prices people can afford. They also offer a subscription box service with free International shipping where they send out 8-10 lollies including 2 or more DIY candy kits in each box. Enter promo code HERQUARTERS2016 at checkout to get 5% off your purchase, valid until the end of the year. A Monthly Box for lovers of DIY Candy Kits. 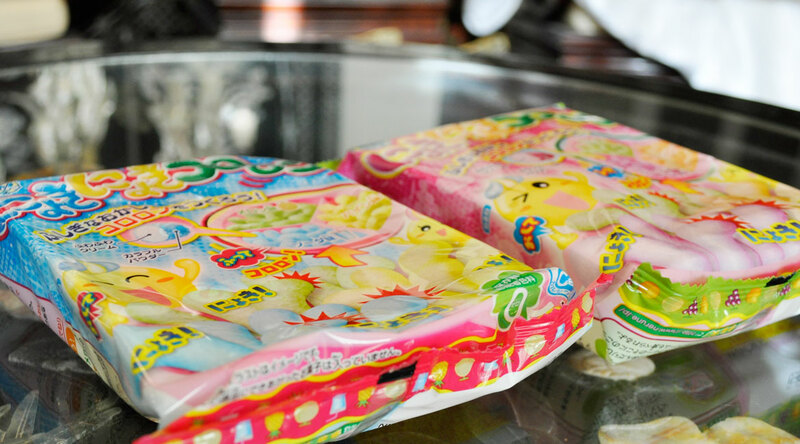 Try those crazy Japanese candies you’ve seen online! For someone like myself who enjoys experiencing unique tastes and super cute Japanese products, Marimo Marshmallow Store offers an easy reliable service with free shipping on orders over $20 US. Yay for not having to travel halfway across the globe to get what I want! I have a new love for DIY Candy kits, and luckily most of them contain easy pictorial instructions on the back. If you still can’t figure out how to make your tasty treats, then head over to Marimo Marshmallow’s youtube channel where you can find step by step demos on how to make your candy kits. You begin with emptying the big sachet into the mixing tray and adding two measurements of water using the provided water cup. Stir well then pop the three-sectioned partition on top and press down lightly to plug the holes in the bottom. Add the 3 remaining sachets into each section then lightly press down and shake to distribute the powder evenly. Repeat the process for more sweet candy swirls. I highly recommend you visit their online store to explore more DIY candies and a bunch of other fun Japanese goodies. *Disclosure: I received these items in exchange for an honest review. All opinions expressed and the choice to review is 100% my own! It’s an interesting experience 🙂 the kids love helping me make them. Haha 🙂 Thanks hon! Have a wonderful weekend! I gathered my kids, niece and nephew and we sat down and made them together. It was so much fun! That looks like so much fun! But did they taste good!? What was the texture like? The texture was soft and tasted sweet and moreish 🙂 I really liked it! These DIY Candy kits are so much fun and very tasty too!